ContactCreator is a free Windows 8 Contact Manager app that lets you save all your contacts at one place. It is a very simple app that lets you create and maintain your contacts list in an easy way. In this app, you can save contact numbers and email ids of your family, friends, and colleagues and view them whenever you want. You can even take photos from your webcam and attach them with your contacts. As I said, the app does the simple job of saving your contacts, but it’s actual worth will be realised if unfortunately, you lose your phone or all your contacts get somehow deleted from your cell phone’s memory. ContactCreator is freely available in Social category of Windows Store. You can search for the app on Windows Store using Win+Q key combination or view it directly in Windows Store by clicking on the link given below at the end. 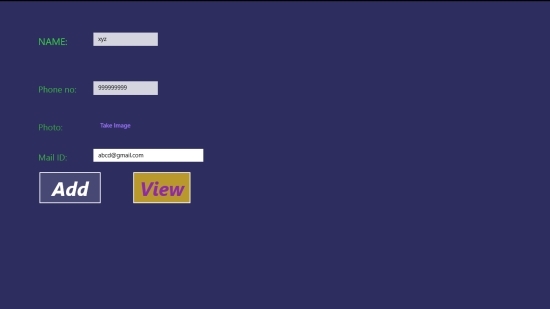 Let’s see how to use this free Windows 8 Contact Manager app to save your contacts. It is extremely easy to save and view contacts in this Contact Manager app. The interface of the app is very simple and user friendly. 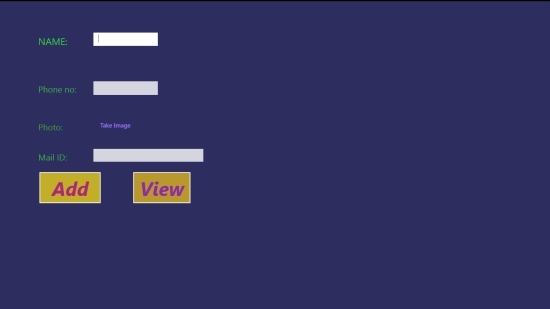 As you install and launch the app on your Windows 8 system, you will directly land on the main page to add a contact. Enter Name, Contact number, and E-mail id in the specified fields and click on Add button. Thats it! The contact details have been added to the app. You can add as many contacts as you want, the same way. To view the saved contact list, click on View button on the main screen. Use back button displayed at the bottom of the screen to go back to the main screen again. 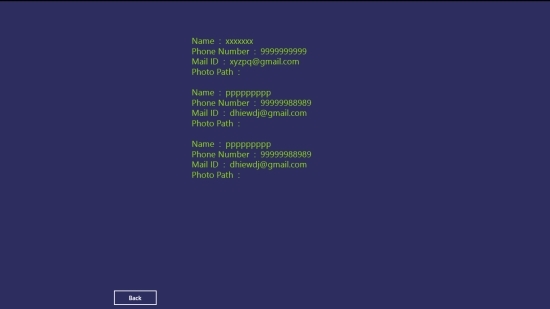 The app also allows you to connect to webcam to take a photo and add it to the contact details. To do so, use the Take Image option displayed on the main screen along with other credentials. Do check out some free Windows 8 File Manager and Windows 8 Password Manager apps we have reviewed. ContactCreator is a simple app to maintain your contacts list. However, you can’t edit any details once they are saved in the app. Also images can only be taken via webcam and not through local media. I also found that the app saves contacts in the sequence as you add them and not alphabetically. It lacks Search option to find a contact too. So, it might be a little uncomfortable when you have to look for a specific person’s contact details out of a long contacts list. All in all, ContactCreator is not as good as Contacts Hub we covered previously, still, a handy tool to maintain your contacts dairy. Try it and share your feedback via comments.